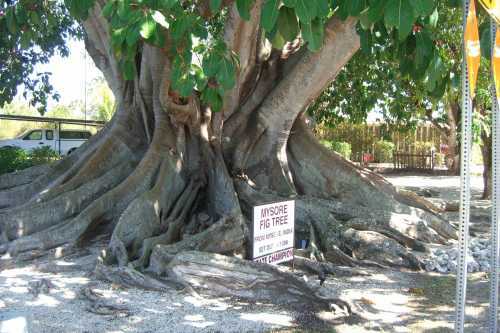 My good friend Vishwa led me to this astonishing story of a Mysore Fig tree holding its sway in far-away Florida, USA. This tree is over 113 years old, and has a care-taker who is 93 years old himself. The entire family is proud of this Ficus Mysorensis, which rises over 90 feet in height and declares its majesty as well as its sweetness through its fig berries that are made into a jelly by the doting family! We talk of NRI Indians and awards that they receive. Look at this unique NRI. He stands tall and proud and healthy, and is not bothered about dual citizenship or double taxation. A model for all of us indeed. The Holy Fig tree, called Ashwattha, is sacred for all Hindus. In Bhagavadgita as well as in Vishnusahasranama, this tree is said to be a form of Vishnu himself. My mother used to say that an Ashwattha tree inside one’s home garden could outlast the building itself and drive its roots even into the foundation. I used to play under an Ashwattha tree as a boy. I was happy to see the same tree all over South East Asia and it may be here even in the botanical gardens in Australia. Chaitanya compares the forbearance of a devotee to the patience and uncomplaining acceptance of a tree. What a noble thought indeed. Jagdish Chandra Bose showed how the tree could express dread at the arrival of the wood cutter with his axe. Osho talks of how he used to talk to the Gulmohur tree in his college campus and how it would always welcome him. Read this fairy tale from Hans Christian Andersen about the Christmas Tree. It is a fairy tale that imagines how a tree feels and aspires much like us. In this case the tree seems to have learnt to feel all the thoughts of the ever vulnerable man! 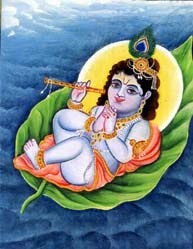 In closing, let me give an image of Bala Krishna, lying on a vatapatra (=Ashwattha leaf), sucking his own big toe!